After the dry winter months, sometimes our hands need a little special TLC. 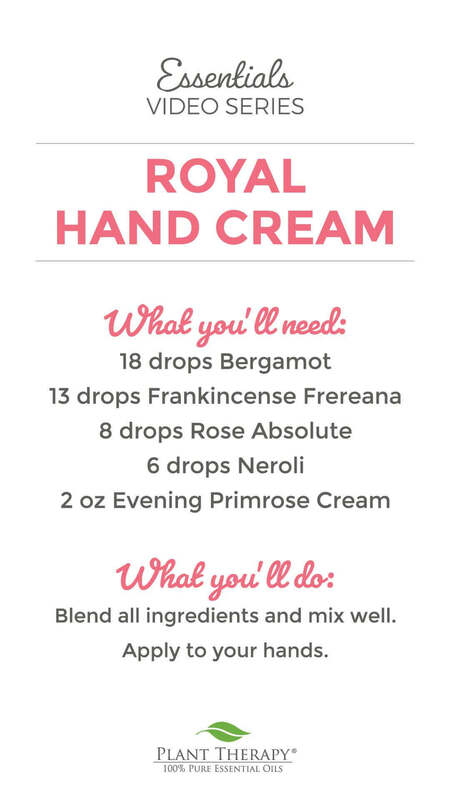 This fantastic Royal Hand Cream is a great way to keep your hands silky smooth. But what makes it “royal”? The essential oils in this blend have a rich history among the royalty. Bergamot and Neroli were often worn by the Princess of Nerola (she is Neroli’s namesake after all). Additionally, Frankincense has been dubbed the “King of Oils” and was one of the gifts brought by the Magi for young baby Jesus. And what would a king be without his queen? Rose, aptly named the “Queen of Essential Oils”, rounds out this beautiful hand cream that is truly fit for royalty. Blend all ingredients and mix well. Apply to your hands. Love this recipe. I’ve made a couple jars of it for my daughter and myself! It really seals in the moisture and has a nice, thick consistency! Thanks PT for the great recipe! I took the plunge a bought rose absolute, then made this hand cream. It was life changing in preventing the dryness and cracking skin on my hands this winter. Love it! I just whipped this up, and it may be one of my most favorite things ever!!! Thanks for an amazing recipe! How would you measure out 2 ounces? Would a kitchen scale work for measuring? I’m really excited to make this blend. For once I have all the ingredients! I agree with above, can you make this synergy so I can buy it premixed? The combo sounds fantastic, and my hands (and my hubby’s) definitely need some TLC since winter is still here. That is an excellent idea that we can pass along! In the meantime, you might try the Anti Age or Soft Skin synergy. Can’t wait to try this diy recipe. I think my dry winter hands will love it. Trying this tonight. My order of the cream came today. So excited to try it!! Sounds delightful. I need to try this one! This sounds divine! If I don’t have that specific Frank, can I use a different one? Would it change the scent completely? Jessica, there will be a bit of a scent change, but it won’t make a huge difference and still provide those great Frankincense benefits 🙂 Frankincense Frefreana is just a bit more sweet smelling than the other varieties. I am going to make this with Frank Carteri, It sounds divine! I usually make my own body butters but this sounds like a much easier substitute when I dont have time to melt and mix everything. I’ve been eager to try the primrose also! Thanks PT! I feel silly. It never even occurred to me to DIY up my evening primrose cream with oils! I’m excited to try this. I finally got all the ingredients to make this and I LOVE it! The hand cream smells divine and is so soothing. Thank you Plant Therapy! Can hardly wait for my rose absolute to arrive so I can make this!! How have I not made this yet?? I was only missing evening primrose cream – ordered!! Ready to make this! We hope you love it, Tara! My Rose Absolute is being delivered today. I can’t wait to try this hand cream!! Definitely need to make some of this for my blood hands from this winter weather. Trying this! Will have to buy evening primrose, but definitely want to try this for rough winter skin?? PS – could you use healing balm instead of the cream?? I have the cream…gonna try this! I’ve had PT creams on my list for a while. This post has given me GOOD reason to finally buy some. Thank you! I can’t wait to make this, however I don’t have Neroli. Is there something else I can use instead of Neroli? This looks amazing. How does this work with sensitization? Can we use this everyday? This recipe looks like fun to make! Thanks for all the creative encouragement Plant Therapy! Making this today with my unscented lotion. I have all the oils. Can I substitute with Frankincense Carteri? Or even Fantastic Franks? I would love to try this! Living in Africa though, so I doubt I’ll be able to find evening primrose cream – would shea butter be a good substitute? Thanks! Definitely going to try this out. I need to get some evening primrose cream. I have oil but this sounds just like what my eczema needs! oh trying this! my daughter’s hands get so red and rough in winter!! I adjusted this to a smaller amount and made a drawer sachet. Smells lovely. I think I will try the lotion as well. That sounds wonderful, Chrissie, thank you so much for sharing! I want to try this! I may have to sub the cream and a different Frank though. This looks like it would feel and smell heavenly! Adding me rose and neroli essential oils to my wish list! So glad I stumbled on this, I love your oils but did not realize you sold cream bases! Can’t wait to try! This sounds lovely but I am missing Rose. I will have to look for a substitute in my oils. I am already going to sub the Franks blend for the Frereana. I don’t have Neroli and have never smelled it. Is there a similiar oil I can substitute? This sounds amazing!!! I will have to add this to my summer fun list. This looks great. Could Helichrysum be used in place of Neroli? Same amount? You can make that replacement if you would like, but it will change the overall aroma. Let us know how you like it! I am definately saving this recipe. But, isnt that a little too much oil? I would love to try this! Can I just use a carrier oil instead of the cream? This sounds like heaven. I can’t wait to make it. This recipe is just what I needed! This sounds lovely!!! I am going to have to try the cream bases you guys offer!! Oh I bet this smells divine!! This is very similar to the facial serum I make. I use almond oil though. I love this combination of oils. They smell wonderful. I use it on my face before I go to bed and my husband always says I smell so nice. Oh this sounds devine! Thanks PT for all the awesome recipes and knowledge! This sounds divine! I wonder if it would work as well with evening primrose oil?? I have everything else to try it out! Thank you for another great recipe, PT! I love these DIY videos, It make everything look so simple. Can’t wait to try this hand cream.